ABBOTTSTOWN, PA 8/4/2018 – Brian Montieth admits they really doesn’t think about the number of wins he has. All he does is think about the race in front of him each night. And for his legion of fans who call Lincoln Speedway home most Saturday nights, that’s just fine by them. 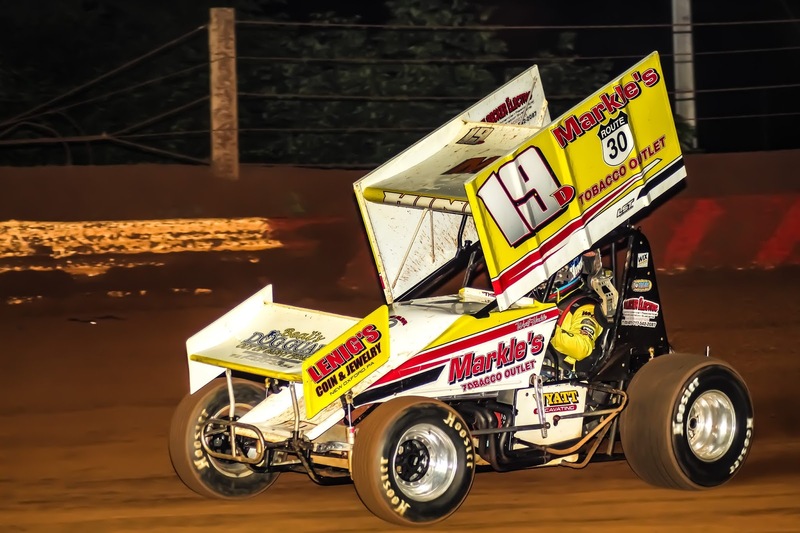 Montieth started on the pole, survived three stoppages of action due to red flags, and raced away to his fourth win of the year in the 25-lap 410 sprint feature Saturday night at Lincoln Speedway. After what Montieth called a bad night of racing last week (7th place), all he and his Premier Autoworks team wanted to do was to do better. And that they did. Starting 7th in the first heat of the night, Montieth simply did what he needed to do. Win his heat and start on the pole for the feature. So, he went out and won it. Now it was a matter of putting together 25 laps better than the week before. At the start Montieth jumped in front after a spirited opening lap duel with outside front row starter Tim Wagaman. After five laps, and starting to close on lapped traffic, the 1st of 3 red flags waved when Tyler Ross rolled in turn four. The restart saw much of the same as he continued to lead the field and opened up over two seconds on second place Wagaman they headed into lapped traffic with 10 laps in the books. Wagaman and third-starting Scott Fisher tried to chase down Montieth as the non-stop lapped traffic got heavier and heavier. But suddenly on the 20th lap the racing stopped. Montieth’s teammate Austin Hogue, driver of the No.21X sprinter, appeared to lose his brakes heading into the first turn, slammed into the outer wall and flipped up into the catch fence. With his car resting on it’s side, the red flag waved, and emergency crews descended onto the accident scene. After many agonizing minutes, Hogue was extricated from the car, placed onto a stretcher, and taken to a nearby hospital. Other than talking and moving his extremities, no further information on Hogue’s condition was available at this time. 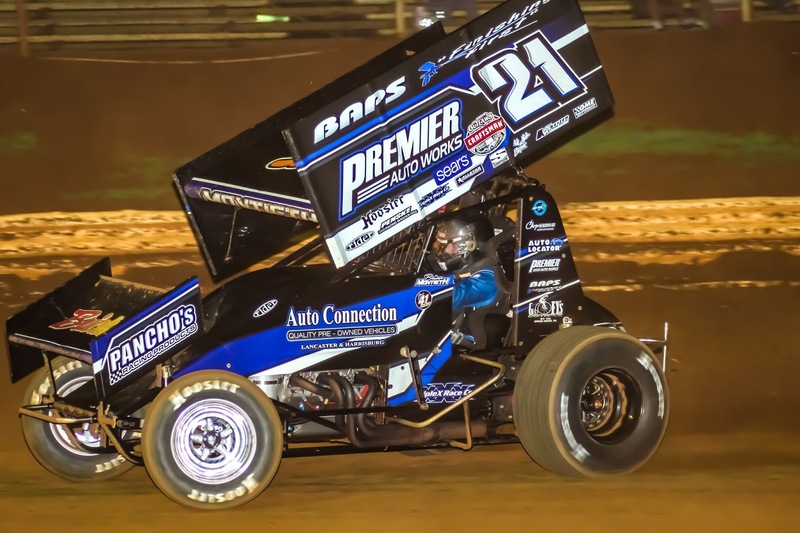 When they got back to racing Montieth continued where he left off with five laps to go and lead the field again until the final red flag of the night waved with only four laps to go when Cole Young rolled his sprinter in turns three and four. Young was okay. But now Montieth had Glenndon Forsythe on his bumper for the restart after Forsythe got by Wagaman on the previous restart for the runner-up spot. But the result was the same. With a clear track ahead, Montieth raced away to his fourth win of the year. Forsythe settled for second, with Cory Haas coming from his 12th starting spot to pass Wagaman in the closing laps for third. “We wrecked that car with Danny (Dietrich) a few weeks ago, which was unfortunate,” added Montieth. “But I think it was the best thing to happen to us because this car is a heck of a lot better…”. Wagaman and 13th-starting Anthony Macri finished fourth and fifth respectively. Completing the top-10 were Chad Trout, Brandon Rahmer, Jim Siegel, 20th-starting Freddie Rahmer, and 15th-starting Kyle Moody. Heats for the 24 410 Sprints on hand were won by Montieth, Wagaman, and Fisher. East Berlin’s Wyatt Hinkle survived a caution with only two laps to go to hang on for his second career win in the 20-lap 358 sprint feature. After losing the lead, and ultimately the race, under nearly the same circumstances a week ago to Tyler Walton, Hinkle now had the same or even harder of situation with only two laps to go. A group of cars with late-race surges were now on his bumper. They included Steve Owings, Tyler Ross, and Scott Geesey. But Hinkle was not to be denied this night as he held off the restart challenge of Owings and raced away to take the checkered .84-seconds ahead for his 2nd career win in the 358 Sprint feature. Owings, Ross and Geesey followed with 11th-starting Troy Wagaman, Jr. finishing fifth. Completing the top-10 were 14th-starting Brent Shearer, Cody Fletcher, Kyle Denmyer, 12th-starting Tyler Walton, and Matt Findley. Heats for the 23 358 Sprints on hand were won by Trey Hivner, Walton, and Geesey. Joe Brown passed Dylan Brown on the eighth lap and raced to the win in the 20-lap “Dizzy Dean” Renfro Memorial for the Classic Racing Series. Neal Reamer finished second, Wes Brown third, Dylan Brown fourth, and Charlie Summers fifth. Heats for the 13 Classic Racing Series cars on hand were won by Dylan Brown and Neal Reamer. Next Saturday night, August 11th, Lincoln Speedway swings back into action with the special time trial 410 Sprint show, along with the 358 Sprinters and the Vintage Modified Shootout cars. Competition Pit gates will open at 5 PM, Spectator Pit Admission & General Admission gates will open at 5:30 PM. Hot laps will get underway at 7 PM, followed by time trials at 7:30 PM.